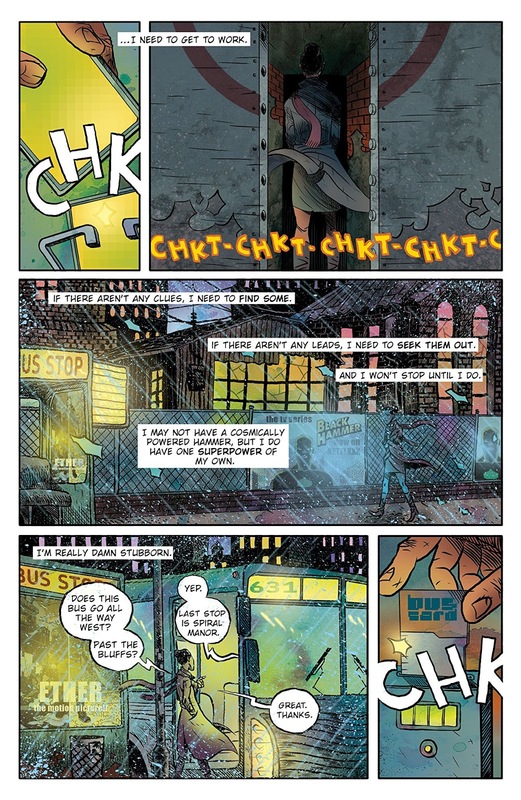 Jeff Lemire's Black Hammer books are, for this reader, the most exciting thing in comics at the moment. 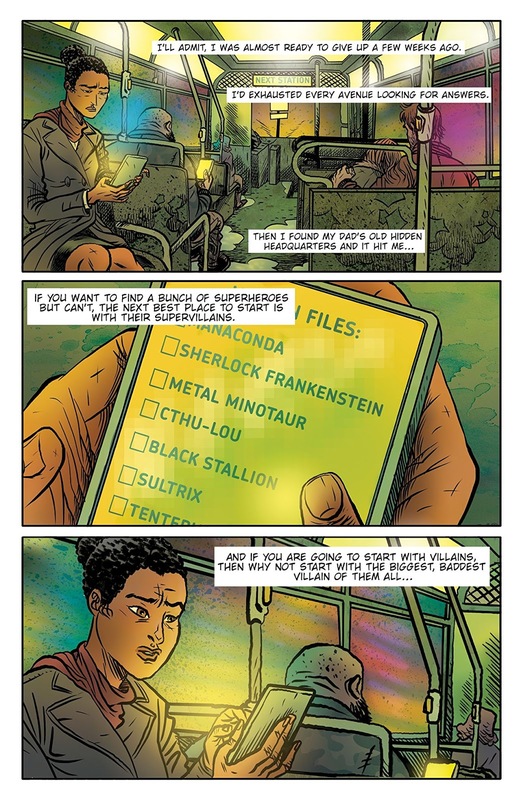 I'm a big fan of Image, DC, and Marvel, but if I was told that I could only rescue one title from the last ten years before being banished to a desert island I think I might opt to take the Black Hammer book (and if I was cheeky I'd ask for Doctor Star and this book too). Okay so I've basically spoiled this review already, but let's see what made this so enjoyable. Okay, first thing's first. Literally. 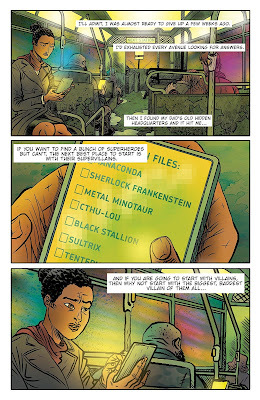 The first issue in this collection comes from Black Hammer 12 and gives us the backstory of Black Hammer's daughter. So those of you who have read the latest installment of the Black Hammer series will be a little ahead of the storyline in this book. Who cares though. I had read issue 12 before, I read it again in this trade and loved it just as much. I also liked the fact that Doctor Star was in it and having read that title his appearance here had an added level of sympathy. Which brings us on to the matter of Jeff Lemire's writing. I could wax lyrical about how much fun his writing is across the Hammerverse. Firstly he draws on all the classic eras of comics from Gold through to Bronze age and he plays on the themes from those periods of comic book history to build his history of Spiral City and the events within it. Secondly, it is a gloriously interlinked world that he has managed to create. This broadens things out in a different direction and tells a standalone story in a different way but it just adds a layer of great detail to the overall Black Hammer story. Thirdly it is riddled with humor - I particularly liked the line where Lucy asks a character to stop talking about himself in the third person. The art style of the main title, the Doctor Star books and this one are all unique, and excellent in their own way. I have to say on this volume I was particularly impressed by the fact that the art style matched the more humorous aspects of the storytelling. The private detention business that houses Spiral City's former supervillains was depicted wonderfully by Dave Rubin. 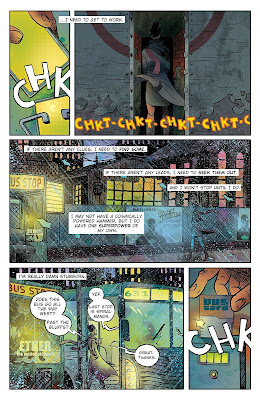 I delighted in both his art and his lettering during those sequences. 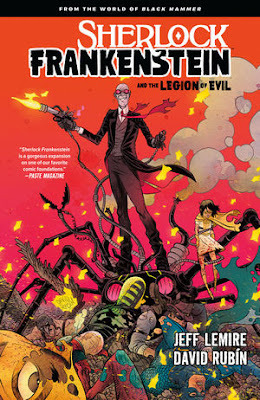 This is a fun volume and it works as a standalone book, an entry-level volume to the Black Hammer universe, or as an extra layer of gloss on the great stories in the other Black Hammer output from Lemire. It underlines the complexity and detail already built up in this world in a relatively short period of time, and it is well worth your time. I'm off to pack my copy in case I need it on that desert island.